Rudy Zuberbuhler was born in 1940 in Lowman, Idaho. He was commissioned through the Air Force ROTC program on June 10, 1962, and went on active duty beginning April 16, 1963. Lt Zuberbuhler completed Undergraduate Pilot Training and was awarded his pilot wings at Vance AFB, Oklahoma, in April 1964, and then after completing F-4 Phantom II Combat Crew Training, he served with the 68th Tactical Fighter Squadron at George AFB, California, from November 1964 to November 1966. His next assignment was with the 10th Tactical Fighter Squadron at Hahn AB, West Germany, from November 1966 to July 1970, followed by service with the 336th Tactical Fighter Squadron at Seymour Johnson AFB, North Carolina. While flying with the 336th TFS, Capt Zuberbuhler deployed to Southeast Asia and flew 368 combat missions before being shot down by a MIG-21 over North Vietnam on September 12, 1972. He was captured the next day and taken as a Prisoner of War, spending the next 198 days in captivity before being released during Operation Homecoming on March 29, 1973. Zuberbuhler was briefly hospitalized at Andrews AFB, Maryland, to recover from his injuries before returning to flying status as the Air Operations Officer for the 4th Tactical Fighter Wing at Seymour Johnson AFB. Col Zuberbuhler went on to fly F-15 Eagle fighters before retiring from the Air Force on July 31, 1991. 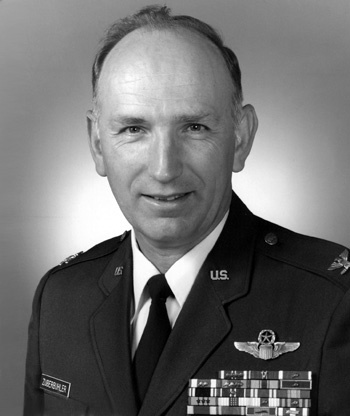 Captain Rudolph U. Zuberbuhler distinguished himself by extraordinary achievement while participating in aerial flight as an F-4 Aircraft Commander over North Vietnam on 13 August 1972. On that date, Captain Zuberbuhler led a flight of four F-4 Phantom Aircraft which was part of a force tasked to dispense a chaff corridor from on initial point to the target in order to provide radar shielding for a follow on strike force. After beginning their chaff run, the force was engaged by enemy aircraft; however, Captain Zuberbuhler, in the face of extreme danger, continued his mission and constructed the valuable chaff corridor. 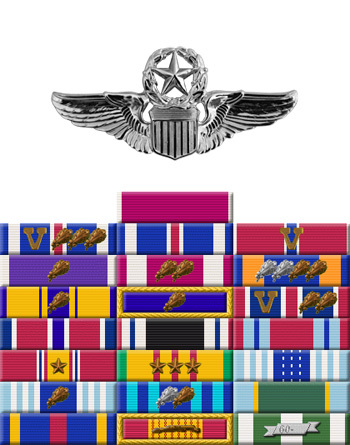 The professional competence, aerial skill, and devotion to duty displayed by Captain Zuberbuhler reflect great credit upon himself and the United States Air Force.